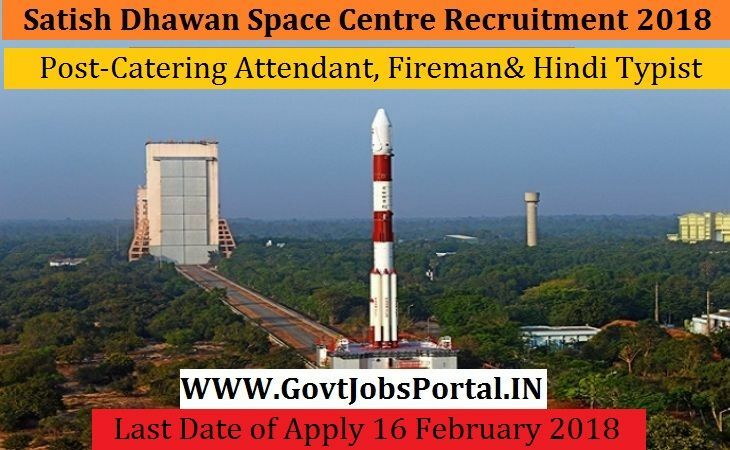 Satish Dhawan Space Centre is going to recruit fresher candidates in India for Catering Attendant, Fireman, Cook & Hindi Typist Posts. So, those candidates who are willing to work with this organization they May apply for this post. Last Date of Apply 16-February-2018. Total numbers of vacancies are 33 Posts. Only those candidates are eligible who have passed Graduation in Arts/Science/Commerce/Management/ Computer Applications with First Class as declared by the University and Hindi Type writing speed @ 25 w.p.m. on computer. Indian citizen having age in between 18 to 35 years can apply for this Satish Dhawan Space Centre Recruitment 2018. Educational Criteria: Only those candidates are eligible who have passed Graduation in Arts/Science/Commerce/Management/ Computer Applications with First Class as declared by the University and Hindi Type writing speed @ 25 w.p.m. on computer.